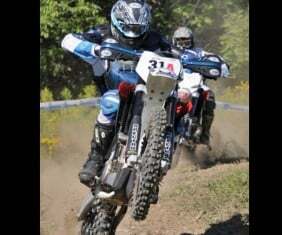 PICKERINGTON, Ohio — The American Motorcyclist Association is pleased to announce the U.S. riders who will contest the 87th International Six Days Enduro. Led by the World Trophy Team of Russell Bobbitt, Mike Brown, Kurt Caselli, Robert Garrison, Charlie Mullins and Taylor Robert, a contingent of 31 U.S. riders will face the best off-road racers from other countries in Saxony, Germany, Sept. 24-29. The ISDE effort this year is managed by Antti Kallonen, who guides KTM North America’s off-road racing teams in U.S.-based series. Caselli, from Palmdale, Calif., will captain the World Trophy Team. He will race a KTM in Germany. Garrison, from Hesperia, Calif., will compete on a Kawasaki. Bobbitt, from Fayetteville, Ga., will race a KTM. Robert, from Scottsdale, Ariz., will ride a Kawasaki. Brown, from Bluff City, Tenn., and Mullins, from Hickory, N.C., will race KTMs. The World Trophy Team is one of three premier teams that represent the United States at the ISDE. The others are the Junior Trophy Team, which fields four riders younger than 23 years old, and the Women’s World Cup Team, which fields three female riders. In addition, several club team members represent the United States at the event. The U.S. Junior Trophy Team will include Steward Baylor from Belton, S.C.; Travis Coy from Fremont, Calif.; Andrew DeLong from Morgantown, Pa.; and Thad Duvall from Williamstown, W.Va. Baylor and Coy will race KTMs in Germany, while DeLong will ride a Husqvarna and Duval will compete on a Honda. The U.S. Women’s Cup Team will include Rachel Gutish from Terre Haute, Ind. ; Mandi Mastin from Whitehouse, Ohio; and Sarah Whitmore from Cheboygan, Mich. All three Women’s Cup Team riders will field KTMs in Germany. The U.S. ISDE team has also designated a Senior Club Team of veterans from the club team members. This year, the Senior Club Team will include Billy Burns from Dorset, Vt.; Jeff Fredette from Beecher, Ill.; and Ron Schmelzle from Colorado Springs, Colo. While the Trophy Team, the Women’s World Cup Team and the Junior Trophy Team are a critical piece of the U.S. effort, they are a small number of the U.S. riders who make the trek to the annual event. Club teams this year include the Wellard Team (Jordan Brandt, Johnny Barber and Fred Hoess); GoFasters.com (Nick Canny, Zach Klamfoth and John Maier); the Boise Ridge Riders (Devan Bolin, Reid Brown and Derek Steahly); the Tony Agonis team (Nicholas Hamill, Michael Jolly and Joshua Knight); and the Missouri Mudders (Scott Bright, Brian Storrie and Chris Storrie). The Senior Club Team of Burns, Fredette and Schmelzle will compete as Team JAFMAR. Weir also thanked longtime World Trophy Team Captain Destry Abbott, who is not on the team this year, for his many years representing the United States at Six Days. The AMA’s ISDE effort would be impossible without the support of various companies. In addition to riders’ individual manufacturer and product sponsors, direct team sponsors include Arai, Spectro, Motion Pro, Wellard and Worldwide Materials Handling. America’s motorcyclists can help support the U.S. ISDE team, and look good while doing it, by buying an official U.S. ISDE T-shirt. All proceeds support the effort to transport the riders, bikes and crew to and from Germany. To buy a shirt, and to get more information about the U.S. ISDE effort, visit www.americanmotorcyclist.com/racing/internationalcompetition/isde.